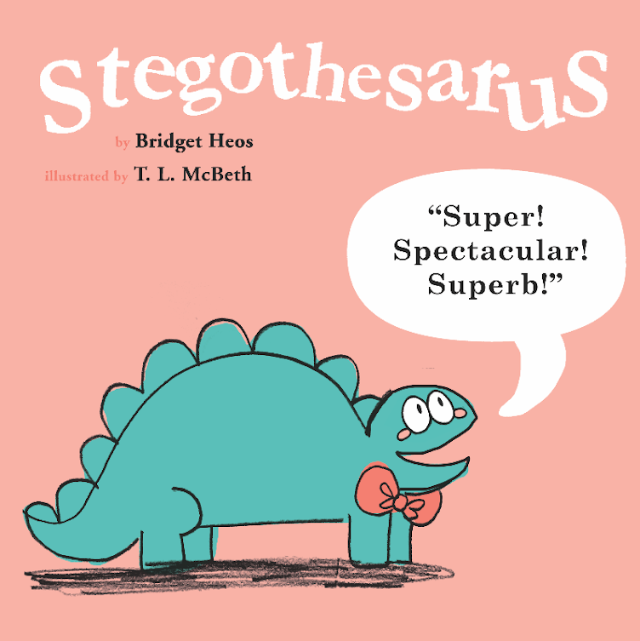 My first book, Stegothesaurus, written by Bridget Heos from Macmillan is out now! I thought I would share a little about the illustration process, check it out below. In August of 2016, I whipped up some Stegothesaurus concept art after my agent emailed me to say that an editor was interested in me illustrating their dinosaur manuscript. I initially tried a few different color palettes. Here’s two other sketchs from the concept phase of Stegothesaurus! 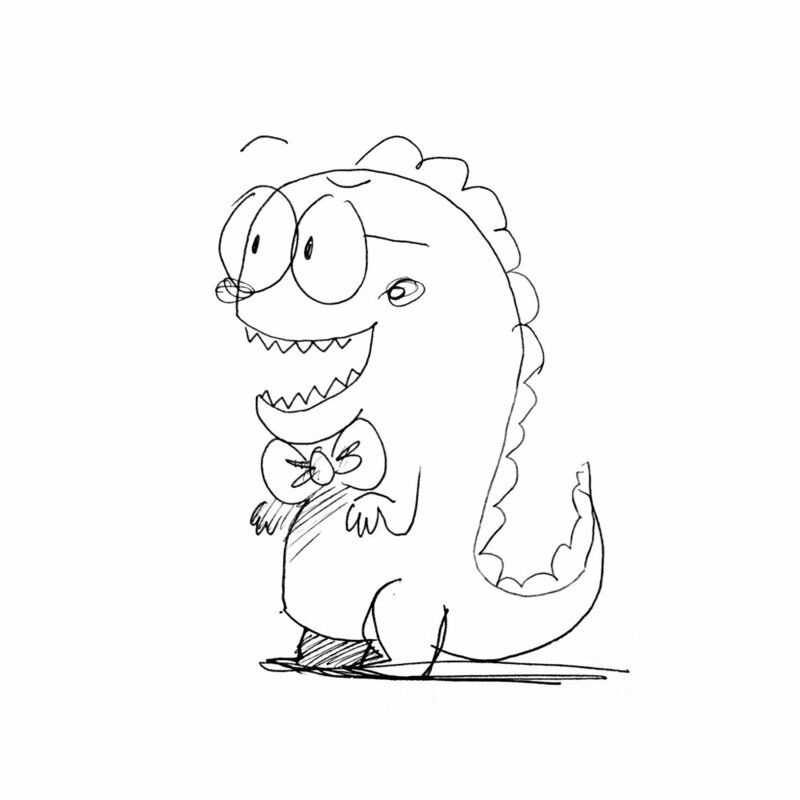 I wanted him to look scholarly, so I gave him glasses and bowtie. After submitting a few concept sketches, I didn’t hear about Stego for awhile. I assumed I didn’t get the gig and moved on to brainstorming other pitches. But a few weeks later I got an email from my agent – it turned out that the editor liked my samples, I received my first offer, and I began sketching and brainstorming. I did a lot of searching for inspiration. If you haven’t noticed, there are a TON of kids books about dinosaurs, and I looked at (almost) all of them. I wanted to know everything I could. These were some of my favorites. One interesting thing I discovered while researching is the cycad, the plant most depicted in dinosaur books. There is one particularly interesting story about a cycad, Encephalartos woodii – it is a real prehistoric tree and there is only one known to still be in existence. 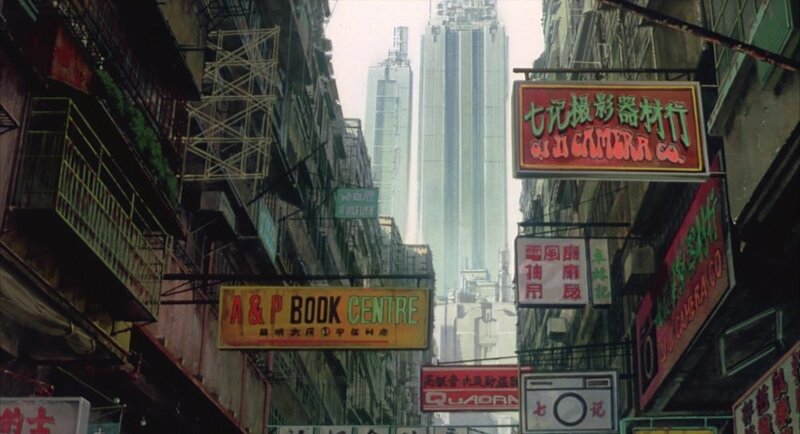 I was also inspired by the way Ghost in the Shell (1995) uses aspect-to-aspect establishing shots to set the scene for the story. 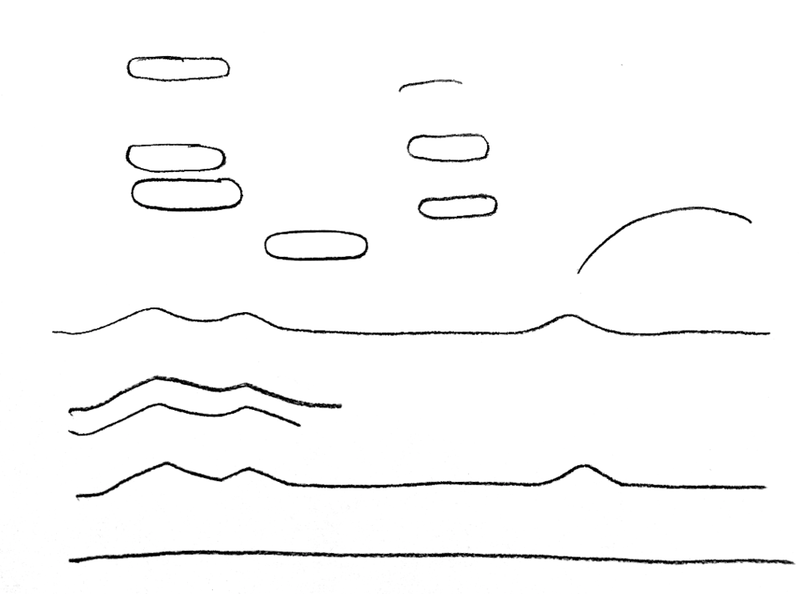 Because of this, I decided to start and end the book with images of the sky and big landscape shots. The endpapers in Stegothesaurus were also inspired by the book The Napping House by Audrey and Don Wood. There is a slight variation in the color of the endpapers from dark blue at the beginning to light blue at the end, which reinforces the arc of the story. I saw The Napping House and a piece of its original art at the Mazza Museum. When I wasn't working on this book, I was spending a lot time playing the classic Mario games. 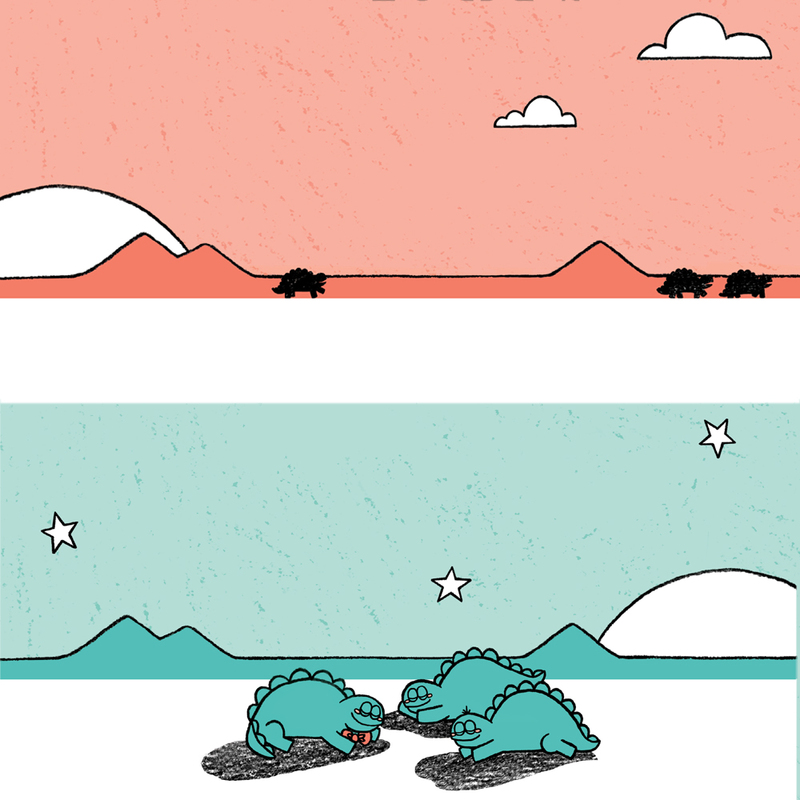 Originally, the clouds in Stego were going to be ovals like the ones below. They eventually were changed out for puffier clouds; however, I think the final landscape still has a very "Mario" feeling about it. Also, looking back, I think Yoshi might have been a subconscious inspiration. Next, I storyboarded the manuscript, developed the characters, and sent over some more roughs. 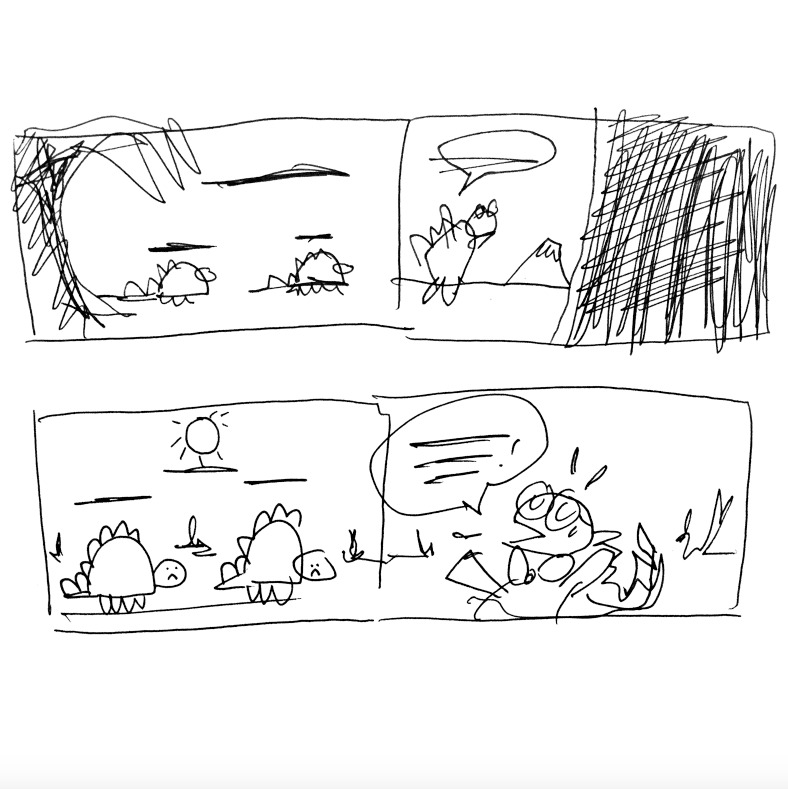 As you can see here, my thumbnails are extremely labor-intensive. Here is a rough idea for the cover. Check out some more interior spreads of the book in no particular order. By the end of 2016, I had finished a full mock book dummy, and I awaited feedback from my editor. Below is another color rough – some are better than others. My editor, Christian Trimmer, was wonderful to work with and gave me a lot of great feedback. For example – initially, I had the Stego brothers popping out of eggs. But it didn’t make sense to have them hatch on one page and appear fully grown on the next, so the idea was cut. 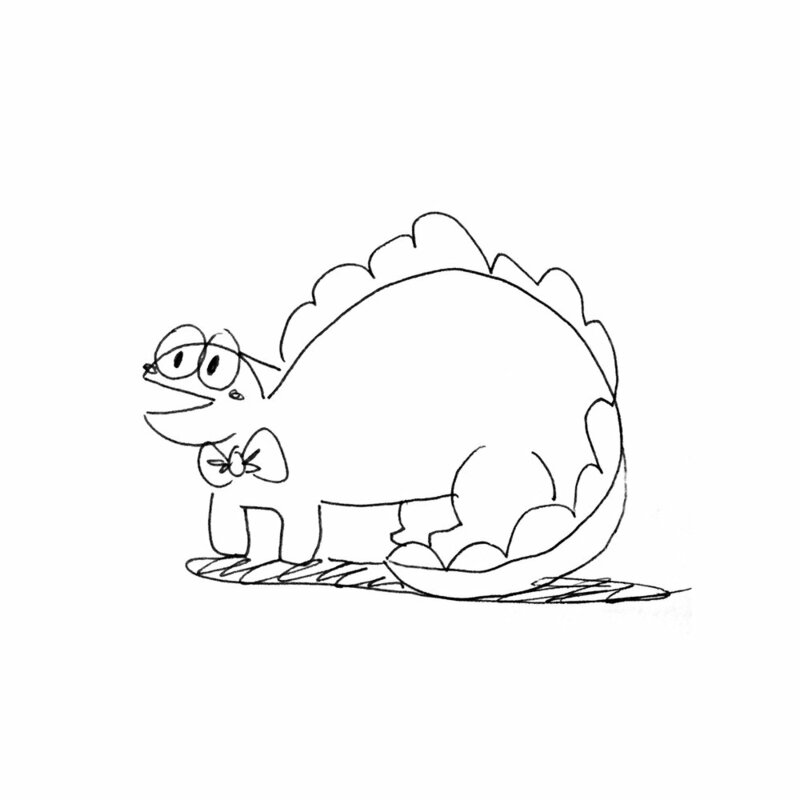 A few other things that changed over the process of making the book – Stegothesaurus originally had glasses with his bowtie. The glasses were cut because they were a little stereotypical as a visual signifier of intelligence. At first I made the Allosaurus character much more realistic (but I decided it was probably a little too scary). The design ended up much softer, and near the end of the process the character was made more feminine with eyelashes and a longer bow. After a few rounds of editing, I began the final artwork for the book. This is how most of the artwork for the book started, as fragmented lines of graphite pencil that I photographed and photoshopped. Here’s the final version of a background for the opening spread that I pieced together in Photoshop. I had never done finals for a book before, so the biggest hurdle to jump was the initial fear of not being totally sure how to do things. Here is the final image with touch ups and text placement. Below an overview of how a spread looks from concept to final artwork. A small Easter egg – I wanted the story to take place over one whole day. You might notice that the sun travels from left to right, moving up in the sky and then setting as the book ends. They dinosaurs also end up in the exact same place they began. Figuring out the cover was one of the hardest parts of the process for me. I pitched a bunch of cover ideas – here’s a few that ultimately got cut. In September 2017, after all the artwork had been submitted and the cover was picked, I received printed proofs of the book! It was amazing to see it in my hands for the first time; until then I had only been looking at it on a computer screen. A few minor tweaks were made to the printed proofs. Then I received some Advanced Reader's Edition's (A.R.E's) of the book that were trimmed and stapled. It was so exciting to see the book come to life. In April of 2018, I received the first hardcover copy of the final book! I can’t thank the team at Macmillan enough for the great job they did on the layout and production. Flash forward to June 12, 2018. The book is finally here! It was a long process that started all the way back in August of 2016. It was fun and scary and one of the things that I'm most proud of in my life so far. Thank you so much to my agent, Kirsten Hall, my editor, Christian Trimmer, and my art director, Patrick Collins. Special thanks to Bridget Heos for such a wonderful text. Special thanks also to Rachel Murray, Mark Podesta, Danielle Mazella di Bosco, Katie Klimowicz, Marcie Colleen, my supportive friends and family, and everyone at Macmillan who made this happen. 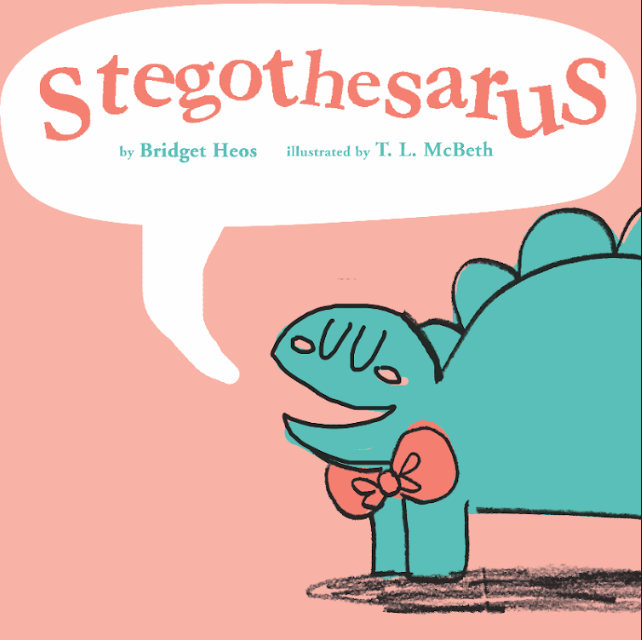 Stegothesaurus is available for purchase online here or wherever books are sold. I designed some Stego pins to celebrate the launch of the book. There are still a few left for sale in my shop. 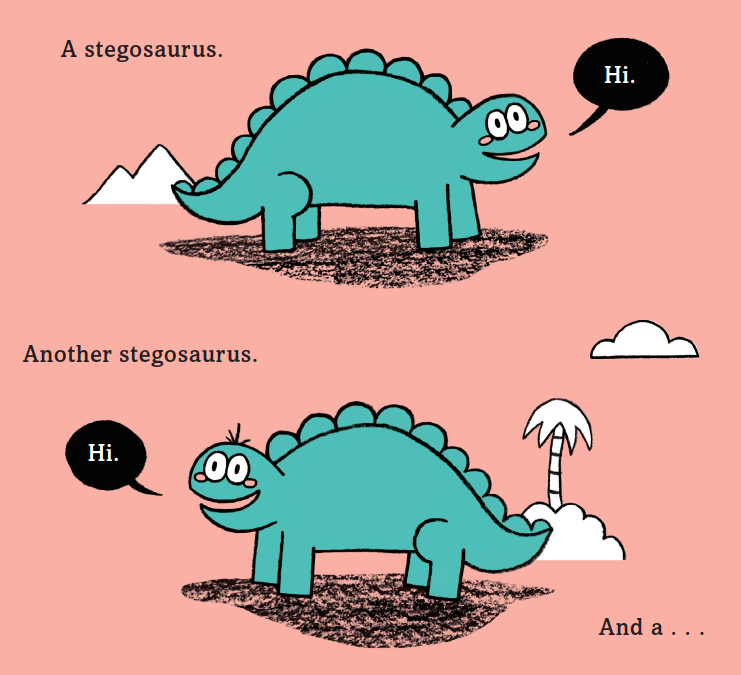 Thank you so much for reading this little behind-the-scenes look at the making of Stegothesaurus. I couldn't cover everything, but if you have any questions about the process or anything at all please feel to ask! Tweet at me! Post a comment on Instagram! or Email me! and I will do my best to answer!